This is a special issue, dedicated to women photographers, the adventurer, the documentary photographers, the aesthetic and fashion, the fine art photographers and to women in all fields, showing their expertise, sometimes courage, and continue to expose the fine art photography field and the beauty and the important issues of our world. 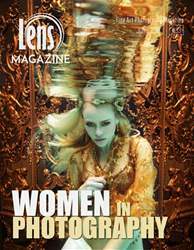 In this special issue, you will find excellent women photographers from all fields, Fashion, Fine art, documentary, travelers, Landscapes, underwater and street photography, You will also find articles and a series of great male photographers focusing on women around the world. We wish you most of enjoyment!